A central element of the Connect! initiative were the visits of representatives of women’s organizations from Sub-Saharan Africa and East to EU New Member States. Their visits were the main contribution to the regional and national dialogues and public events. They shared the first-hand analysis, experiences and challenges they face at home, their achievements and contribution to development cooperation. They stressed the importance of East – South solidarity and linkages. The Regional Dialogue on women’s rights in development cooperation organized by KARAT Coalition in collaboration with One World Action (OWA) was held on 12 -13 May 2010 in Warsaw, Poland. The main aim of the Dialogue was to increase the capacity of women’s organisations in New Member States (NMS) through learning, exchange of experiences, and networking to generate stronger collaboration between women from East, South and West on EU gender equality and development policy and practice. The Regional Dialogue was attended by 35 participants from 5 countries (Bulgaria, Czech Rep., Georgia, Poland, Romania, Slovakia, UK, Ukraine and Zambia), 3 resource persons (Georgia, Ukraine and Zambia), representative of DFID (Department for International Development – UK governmental agency), 3 representatives of Polish MFA (Ministry of Foreign Affairs), 2 representatives of OWA (UK) and 3 persons from KARAT’s Secretariat (Poland). Participants were NGOs from EU New Member States interested/involved in the Development Cooperation including KARAT members – women’s organizations – partners in the project Connect. The National Dialogues in New Member States were one of the main activities within the project. The Dialogues and Public Events enabled to set a background for cooperation between women’s organizations and NGOs from old and new member states. It was also the opportunity for stimulating greater interest in those organizations in support for gender-sensitive and gender-responsive development cooperation and assist them in building bridges with women’s organizations from Sub-Saharan Africa. The dialogues built the NGOs capacity to engage with and influence their governments towards supporting the full integration of gender issues in European development co-operation (member states and European Community aid). A public event was held after each of the Dialogue to attract the attention of media and raise public awareness on women’s rights, and gender in development issue by presenting the experiences of women in the South and these from the new member states. The project envisaged four National Dialogues placed in Bulgaria and Romania in February 2011 and Czech Republic and Slovakia in November 2011. The National Dialogue on Gender Equality in the International Development Cooperation Programs in Sofia was organized by the Bulgarian partner Gender Education, Research and Technologies Foundation (GERT). 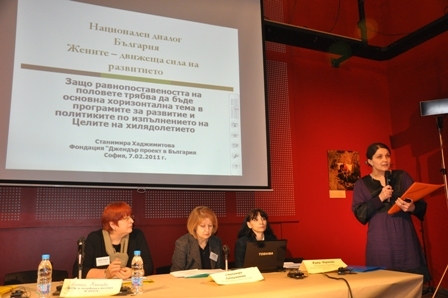 The Dialogue took place on the 7th of February 2011 in the Red House (Center for culture and debates). It was attended by international guests from Sub Saharan Africa: Edith Chipo Kanjo from Coalition of Women living with HIV/AIDS from Malawi and Atupele Babis Chirwa from Malawi National Women’s Lobby Group, specialists from One World Action and KARAT Coalition and national NGO’s representatives, government institutions representatives, special guests – among of them: the Ambassadors of Norway and the Ambassador of the Netherlands, four women from different African countries living in Bulgaria as well as the president of the International Women’s Club in Bulgaria. The public event addressed to the general public followed the National Dialogue. The audience of the public event was slightly different from the one of the National Dialogue. There were more participants from the civil society, academics, and university students, women from African countries living in Bulgaria, as well as women attracted by the topic advertised by the Red House itself. It was a good opportunity for the activists from women’s NGOs and other non- governmental development organizations (NGDOs) to meet and discuss the issues of both gender equality and development cooperation. It was a place to exchange views and concerns, ideas and experiences and to meet people from state institutions. The event was also one of the few opportunities for women activists to discuss the current status of gender equality after joining the EU and the new engagements of civil society in advocacy for mainstreaming gender in development cooperation. The exhibition “Through their Eyes, through ours” (which was created as a part of other project carried out by KARAT Coalition) representing women from the CEE from different background and in different conditions of life contributed to the exciting environment of the dialogue and the public event. The National Dialogue “Practicing the promises: Gender equality and women’s rights in the EU ‚NMS’ development cooperation”, was held at the House of Parliament in Bucharest in Romania on the 9th of February 2011 organized by ‘AUR’ – The National Organization of Human Resources Specialists. The aim of the event was to increase the capacity of women’s organizations in Romania, through learning, exchange of experiences, and networking to generate stronger collaboration between women from East, South and West. The event was attended by representatives of organizations working on women’s empowerment and equal opportunities both at national and international levels: Edith Chipo Kanjo from Coalition of Women living with HIV/AIDS from Malawi, Atupele Babis Chirwa from Malawi National Women’s Lobby Group, Valentina Bodrug-Lungu from Gender – Center from Moldova, specialists from One World Action and KARAT Coalition, decision makers involved at the national and European level in promoting gender equality and development cooperation, well-known Romanian parliamentarians and Romanian Members of the European Parliament, representatives of the Romanian Ministry of Foreign Affairs, non-governmental development organizations (NGDOs) active at the national level, The Romanian Federation of NGOs for Development (FOND). 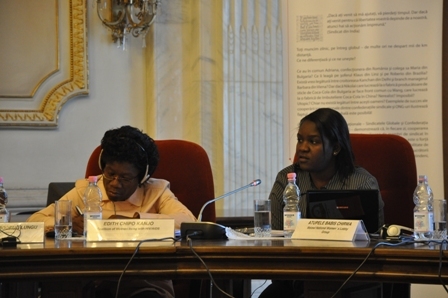 The National Dialogue was concluded with a public event aiming to bring to the public and media attention the two issues – Gender Equality and Development Cooperation, through a constructive dialogue between representatives from the developing countries (Sub-Saharan Africa and Moldova) and decision makers involved at the national and European level. The event started with a short artistic moment, done by the Romanian actors from the Art School “Corifeu”. They succeeded in presenting current realities of women from different countries (developing countries Africa and Republic of Moldova, old member states Germany and new member states Romania), with different backgrounds of education and perception of daily life. In the conclusion of the artistic moment, the women “awake” from their day-to-day schedule to see that they are not alone and that they can Connect!. 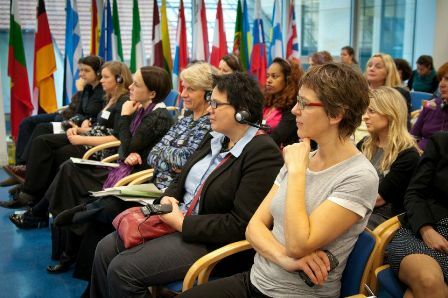 The National Dialogue “Gender Transformative Policies in Development Co-operation” was held on November 8th 2011 in European House in Prague and gathered more than 40 participants. The audience consisted of members of the Green Party, the Policy Officer of Czech NGDOs platform – Czech Forum for Development Cooperation (FoRS), Czech NGDOs (Glopolis, Caritas Czech Republic, Fair Trade Association NaZemi, the Humanist Centre Narovinu, ADRA) as well as gender NGOs (La Strada, ProEquality, Nesehnutí, Gaia, etc. ), the representatives of platform DEMAS (Association for Human Rights and Democracy), Czech Against Poverty platform and representative from academic (The University of Economics, Prague) were present during the conference. The aim was to bring discussion on the gender perspective in the development cooperation in the Czech Republic. The differences between the impact of development policies on men and women were presented and the solutions on inclusion of gender perspective in the development practice with concrete examples were described. The aim of the National Dialogue was met through a whole day program that consisted of presentations of main findings of the case study on Gender Transformative Policies in Development Cooperation in the Czech Republic, through a pannel discussion with following guests: Barbara Unmüssig (the Co-President of Heinrich Böll Foundation), Sara Worku (People in Need, Ethiopia), Chipo Kanjo (Coalition of Women Living with HIV/AIDS, Malawi), Ondřej Horký (Institute of International Relations) and through a participative workshop about possibilities on partnership of EU NMS NGDOs and partner organizations. As two associated events the lecture for students (both bachelor and master students) on a Palacký University in Olomouc, International Development Studies on November, 9th ,2011, and the public event in Prague focused on raising awareness towards the topic of gender equality in Czech development cooperation, challenging possible stereotypes towards partner countries and fostering the partnership of NMS and partner countries on November, 7th, 2011 were held. The Round Table in Bratislava, Slovakia was held on November 10th, 2011 and was the latest in the series of four national dialogues that have already taken place in three EU New Member States (Bulgaria, Czech Republic and Romania), with the opening, regional meeting in Warsaw. The program of the National Dialogue consisted of a round table with selected stakeholders (around 20 representatives of different institutions and civil society organizations) and quests from Sub-Saharan Africa: Sara Worku (People in Need, Ethiopia), Chipo Kanjo (Coalition of Women Living with HIV/AIDS, Malawi) and speakers from KARAT Coalition and public event – informal lecture – targeted to the broader audience, especially to students, on Trnava University. The policy paper – Round Table on Promotion of Gender Equality and the Status of Women in Programs and Projects of Development Aid in a Dialogue with the Countries of Sub – Saharan Africa which is the outcome document from the event is available in English and in Slovak. The conference of the “Connect! East South West Women for Development” project was organized by KARAT on December 13-14, 2011 in Warsaw entitled: Practicing the Promises: Post-Busan development agenda from gender perspective. Opportunity or challenge for EU NMS? as an associated event to the European Development Days 2011 held in Warsaw, Poland. This meeting was a next step in 3 year work of KARAT members in Bulgaria, Czech Republic, Slovakia, Romania and the Secretariat in Poland aimed at greater inclusion of gender equality and women’s empowerment in development policies and practices of EU New Member States. KARAT’s advocacy, awareness raising, networking activities have been implemented based on the constructive dialogue and in close cooperation with development organizations, especially NGDO platforms in NMS as well as MFAs and Agencies responsible for development cooperation in NMS. The conference was joined by: representatives of women’s and development NGOs from Bulgaria, Czech Republic, Poland, Slovakia, Romania and Austria, experts on gender and effectiveness issues , representatives of partners from developing countries of Central Asia (Kyrgyzstan) as well as Africa (Kenya and Malawi), representatives of Ministries of Foreign Affairs (MFAs) from Bulgaria, Poland and Slovakia as well as Czech Development Agency. In total, around 35 participants representing donors and beneficiaries of development aid. Development of common advocacy strategy of CSOs from EU NMS for gender sensitive implementation of aid effectiveness agenda after HLF4 in Busan. See the electronic information package on gender equality in aid effectiveness process which was distributed during the conference.